Pro or anti, utopia or reality, love or hate, Europe leaves no one untouched. Story-Line Maastricht brings storytellers on stage exploring Europe in Lumiere Cinema Maastricht. Date: Tuesday 26 March. Mathieu Segers, professor of contemporary European History, writer and columnist (De Groene, FD), talks to the best-selling Italian author, Francesca Melandri, and the Dutch novelist, Lodewijk van Oord. Film critic, Dana Linssen (NRC, De Filmkrant), will talk to young film maker, Ena Sendijarevic (winner IFFR jury award), by showing clips of her films. Francesca Melandri’s best-selling novel, Sangue Giusto (Right Blood), is a book that reads like a film: a tired high school teacher walks up the stairs to her apartment in Rome after a long day to find a black boy on her doorstep. ‘You are my aunt,’ he says. And with these words he opens up a story about people in the maelstrom of Europe, of Italian fascism and its dark colonial past. Young Dutch-Bosnian film maker, Ena Sendijarevic, arrived in The Netherlands when she was seven, fleeing from the war in former Yugoslavia. In January, she won the jury award with her debut feature film, Take Me Somewhere Nice, a road movie that looks at Europe through an absurdist lens. And Spoken Word artist Samira Saleh will perform, with poetry about Europe! During the event there will be an exhibition in the foyer of Lumière of the media collective Are We Europe. This collective, founded by and for (young) Europeans, provides an alternative perspective on Europe. Through the power of stories, we will shine a new light on our continent. 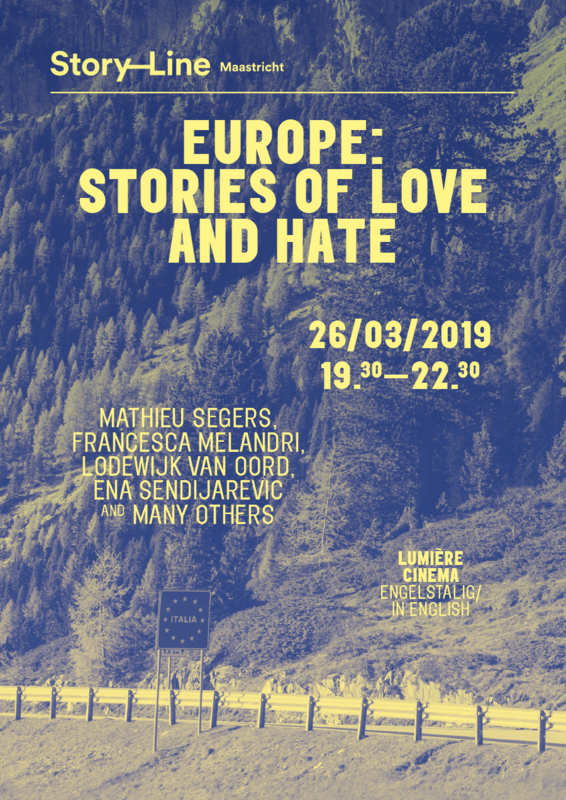 Europe: Stories of Love and Hate is organized in collaboration with Lumière Cinema, Maastricht – working on Europe, viaStory, Studio Noto en Europe Direct.